Umuowaga Asa Obuzo say yes to IPOB and Biafra. 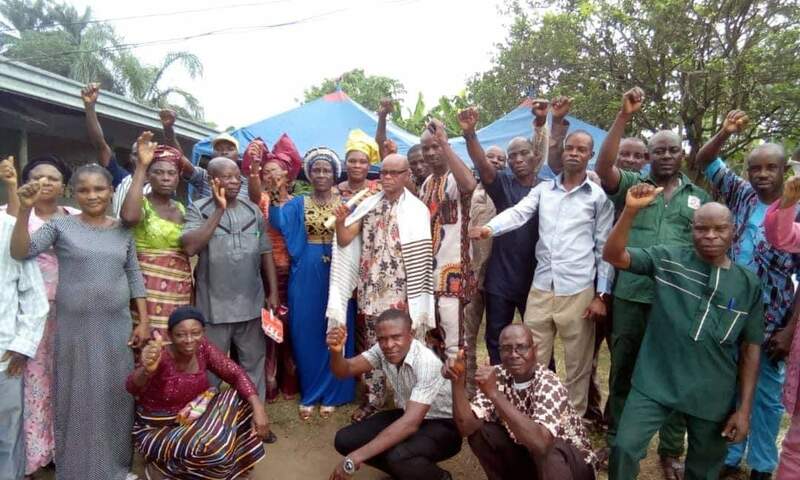 The IPOB meeting which featured Uzoamaka Ejezie, A.K.A Mama Biafra (The Biafra Land Women Leader), Lolo Obiageri Nwaigwe, Mazi Ifeanyichukwu, Mazi Ugochukwu (Okwu ana aso anya), Mazi Francis Okorozu (Obuzo zonal coordinator) Mazi Jude (Abia South Mobilization Officer), Elder Phillip Nwannete (Old Soldier), Pastor Timothy, Pst. Gentle C., Mazi Emmanuel Ogbonna, Mazi Samuel Akpan, Mrs. Esther Okoro (Obuzo women leader), Mazi Ebere Onwundi, Mrs. Joyful Johnson, Members of IPOB families in Obuzor and so many others started with songs of praises and an opening prayer said by Lolo Obiageri Nwaigwe on 31st March, 2019. Pastor Timothy prayed for the Kola, which was presented and broken by Mazi Ugochukwu, then the meeting commenced. “We must also be grateful to God for sending us someone like Mazi Nnamdi Kanu who has remained the arrow head” He also went further to advise Biafrans in Obuzo to practise the attitude of "one family" which has remained the reason why IPOB will keep waxing strong. "As a mobilization officer, my job is to make sure the gospel of restoration spreads to places under my jurisdiction. Don’t just say "one family" only on the lips but practise it at all times” he echoed. He thereafter reminded the people of Obuzo on the need to pray for Mazi Nnamdi Kanu and other sincere principal officers on daily basis and also on the need to support their coordinators where necessary. Mama Biafra (Uzoamaka Ejezie) in her own way addressed them in a motherly manner, “Our Leader is Mazi Nnamdi Kanu, and it is he alone that we will follow in this struggle because he speaks the truth, we have all come out because we want to be free. The name Nigeria was laid on an insignificant ground, Nigeria is a fraud!, If you doubt me, tell me those who signed the document that made us one Nigeria because Nnamdi Azikiwe was too young to sign any document as at 1914. The truth is that we are not one in all aspects with the Hausa/Fulani people (Arewa) and the Yoruba People (Oduduwa), if a fulani or Yoruba man/woman is walking from afar, It won’t even take me much time to tell you that he or she is from Arewa and Oduduwa respectively because their way of walking is so different from ours”. Furthermore she said; "our so-called politicians who have betrayed us and now serve their Masters (Hausa Fulani) are unaware that the security of the rich is tied to the comfort of the poor; very soon they will understand that power belongs to the people, Mark my words “They will all regret their actions and cry "had I known". When the time comes, they will have no place to run”. In conclusion, she said, "all we want is to be on our own and do things our own way. I hear people say we will fight ourselves when Biafra is restored and my response has always been; let’s restore Biafra first. We are out to restore Biafra and there is no going back. As you go to our various homes today, Keep the fire burning, don’t fail to educate people on Biafra, make sure the gospel spreads to the ends of Ukwa West. There should be no dull moment in your zones. Meanwhile, several questions were asked by members of IPOB in Obuzo which the principal officers present attended to and made sure no question remained unanswered. Finally Pastor Gentle C., Elder Phillip Nwannete and Mazi Francis Okorozu (Obuzo zonal coordinator) thanked the principal officers for coming to assist them in spreading the gospel of restoration of Biafra, promising to keep the fire burning. "The more they (The Nigerian Agents) Bark like dogs, the more we spread” they said.